Looking for an interior ventilation system that is powerful, versatile, durable and easy to operate? 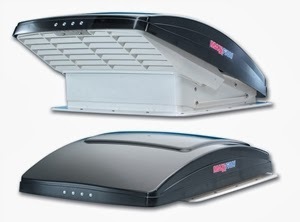 Then Maxxair Maxxfan Deluxe Ventilator may just be the ideal for your situation. It features a 10 speed fan that’s capable of circulating 900+ cubic feet of air per minute. As far as versatility goes, it can be used as an exhaust, intake or ceiling fan. We also happen to love the flush mounted keypad, removable insect screen and warranties that come along with it. If the stink is coming from your campers holding tank, Camco’s Cyclone RV Sewer Vent would a wise investment too make. What we like about the vent is that it is simple to install and requires no electricity. It operates on wind power instead. 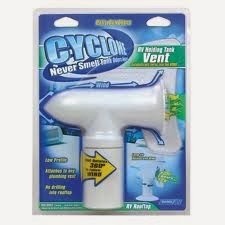 So it will remain an efficient and effective method of odor control no matter where you decide to park your RV. For extra added odor protection, you may want to think about pairing the Cyclone RV Sewer Vent with Kronen Premium Holding Tank Treatment. After trying so many different brands of black tank chemicals we have found Kronen's to be the most effective in eliminating odors and dissolving solids. It utilizes a potent combination of nature's naturally occurring micro-organisms, that are engineered to break down and liquefy organic materials leaving you with a completely odorless liquid. Replacing your RV’s air conditioner filters often can also aid in keeping odors generated by the presence of mildew, mold and dirt at a minimum. Allergy4 makes several great, anti-microbial filters that would be ideal for use with an RV system. Among them are products designed to be used with the Duo-Therm Brisk Air/Quick Cool and Coleman Mach Series air conditioners. Odor eliminating sprays and canisters are another set of products beloved by our RV parts supplier pros. Each one is designed to abolish scents from the air as well as fabrics. This includes odors generated by pets, cooking activities, holding tanks, clogged drains and garbage cans. There are also products like the Fridge It Odor Eliminator and Camco RV Stainless Steel Trash Can that may help too. 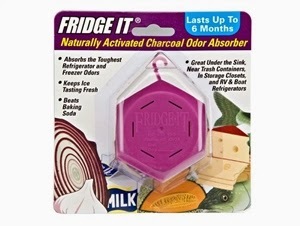 The eliminator gets placed inside of the refrigerator to prevent the transfer of food odors and gases. The trash can, on the other hand, features a secure lid and a removable insert that will help to keep garbage odors from wafting throughout the RV. Last but not least, HEPA vacuum bags are worth investing in for your Dirt Devil CV1500 RV vacuum. Some disposable HEPA vacuum bags, like those made by Dirt Devil, can help remove smoke related particles that contribute towards odors. These replacement vacuum bags capture 99.97% of all particles .3 microns and smaller including common allergens and mold. While our top 5 may cover some of the basic ways to eliminate odors in your RV, if you require help with specific odors check out this article on the 20 Most Common Odors and How to Remove Them Fast.